What do you believe? When talking about faith and works yesterday, James now make this statement about belief today. Read James 2:18-19. 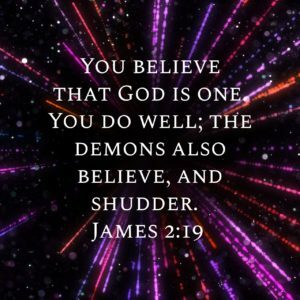 When discussing faith and the fact that if faith doesn’t lead to action then it’s dead, James further illustrates the point by saying that the demons believe that God is God. They have a knowledge of this, but their knowledge doesn’t move them to place their faith in God and then act on it. They know God, and they tremble at that thought, but their knowledge doesn’t move them to act on it. Do you know God? Do you believe that He exists and is Holy? Does that knowledge transform you to take the next step and place your faith in Him? When you put your faith in Him, does it spur you to action that transforms your life and is evident to those around you? God is Holy and worthy of all our faith and deserving of the actions that go with it.